Sanae and Imane laghriss, who benefited from a Royal Pardon last Friday, told Morocco Times they were victims of fundamentalist thought. 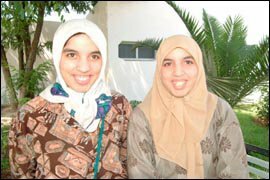 The twin sisters were sentenced to 5 years imprisonment in Jan. 2004 for belonging to a Rabat terrorist group, who planned to bomb sites in Morocco's capital. “The period we spent in the prison made us realize that we were totally wrong”, they said. The 16-year-old Sanae and Iman were accused of forming criminal gang to carry out terrorist acts, gathering money to fund terrorist activities, begging, defaming sacred symbols, organizing public meetings without authorities' permission and conspiring against the King and His Royal Family. The two young girls volunteered to commit suicide bombings in the parliament building and in “Al hayat Al jamila” supermarket in Rabat. They were arrested while holding pamphlets defaming HM the King, tapes inciting extremism and fighting what the “Assalafiyah Al Jihadia” group calls “the tyrant”. “We were overwhelmed with joy when we heard about the Royal Pardon. I want to live a normal life with my twin sister and my mother. I wish I can be able to find a job and settle down”, said Sanae. The twins were transferred to the 'Abdessalam Bennani Center for Childhood Protection' in Casablanca after having benefited from the King's pardon. Sanaa was arrested when 12 officers took hold of her mobile containing numbers of the “Muslim brothers” phones and SMS venerating Ossama Bin Laden and Al-Qaeda cell. Iman told Morocco Times that officers also took hold of some tapes, among them “disbelieving the tyrant”, which is a tape of the Saudi missioner Bichr Bnou Fahd Al Bichr. Police also seized another tape entitled “what is Taliban government” and leaflets containing sentences of defamation of the King. Sanaa thinks that poverty and her separation with her sister drove them to get drifted into extremist thoughts. “Since 2002, we were pushed to volunteer in suicide bombings by the Muslim brothers,” she said. The Judge of the Court of First Instance in Casablanca has ordered to keep the two sisters in the 'Abdessalam Bennani Center for Childhood Protection' temporarily till they reach the legal age, in case their family did not contact them. Responding to the Royal Pardon, Abdelfattah Zahrach, the sisters' lawyer, told Morocco Times he was “grateful to the King, especially since it concerned two adolescents victim of terrorist and obscurantist ideology”. The lawyer appealed to the civil society to “adopt” the twins who were still, in the Abdesslam Bennani Centre in Casablanca. According to Assia Elwadie, responsible for the Reform centre for young delinquents, the twins will come under the procedure for children in precarious situation, given that they are minors and that their mother is incapable of looking after them. Sanaa and Imane were among the 77 Islamists who had benefited from the Royal Pardon last weekend. A total of 121 prisoners, tried under the anti –terrorism law, had benefited from the Royal Pardon. Seventy of them were released on Saturday on the occasion of the Revolution of the King and the People's Day, seven were released on Sunday on the occasion of the Youth Day, and forty-four others had benefited from Royal Pardon on other occasions. Among the freed prisoners Abdelqadar Labssir, who was sentenced to 16 years for the planning for a blast in Rabat. Labssir went on hunger strike for 67 days, before he was released. The two others were Mohammed Hadri who was sentenced to 8 years, and Abdelkbir Sikel who was sentenced to 6 years. All the freed prisoners had spent only two years in prison. A communiqué of the Ministry of Justice said that the freed prisoners were obedient, had behaved well, and promised not to return to their crimes and to give up their fundamentalist ideas. The release added that they expressed their desire to reintegrate in the society as good citizens. Rabat---FBI director Robert Mueller, who started an official visit to Morocco yesterday to discuss with high-ranking Moroccan officials security issues and international cooperation in the fight against terrorism, said that no country or agency in the world can be successful without cooperation. “Countries have to work closely together in an era of globalization and technology to exchange information to prevent attacks and criminals from from preying on our people,” he told Morocco Times. “Therefore associations and friendships bewteen our countries are exceptionally important,” he added. Mueller also said that the FBI has also addressed ways to cooperate with Moroccan security officials to exchange information in policing and fingerprints and DNA dabatases. The FBI head was recieved on Tuesday in Rabat by HM King Mohammed VI. “I have discussed with King Mohammed VI the fact that the War on Terror addresses certainly those few individuals who would undertake terrorist attacks,” Mueller told Morocco Times. “But this also means that we have to work with the social structure, developing jobs and opportunities that King Mohammed VI has in his vision over the last several years. My discussion indicated how it is important to compliment him on addressing these issues,” he stressed. The FBI head was accompanied in the audience by US ambassador to Morocco, Thomas Riley, and FBI representative in Rabat, Lauren Anderson. Today's meeting was also attended by Al Mustapha Sahel, Minister of Interior, Hamidou Lâanigri, General Director of National Security, and Abdellatif Hammouchi, head of the Direction Générale de la Surveillance du Territoire (DGST). The US official is also scheduled to visit Algeria and Tunisia this week. Reuters reported on Monday that the FBI head's visit coincides with Moroccan media reports that suspected al Qaida members were attempting to sneak into Europe from the region. According to the same agency, Moroccan media has suggested group members were infiltrating waves of illegal sub-Saharan migrants arriving in Morocco and Algeria. 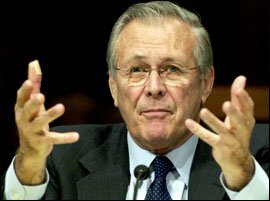 Mueller's visit precedes that of US Defense Secretary Donald Rumsfeld, due in the Maghreb region on Sunday after a NATO summit in Sicily. It will be Rumsfeld's first visit to the Maghreb. Morocco, a strong US ally in the region, has clamped down on suspected cells of Islamic radicals since 2003, when multiple bombings in the country's business capital Casablanca killed 45 people and shocked the normally peaceful country. 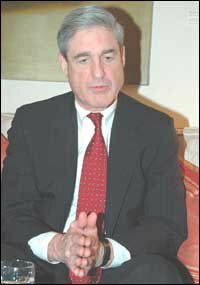 Robert Mueller was nominated by President George W. Bush and became the sixth Director of the Federal Bureau of Investigation on September 4, 2001, only one week before the 9/11 terrorist attacks that claimed the lives of more than 3000 people. The US Secretary of Defense, Donald Rumsfield is expected in Marrakech (southern Morocco) on Sunday to discuss ways of reinforcing military cooperation between Morocco and the United States, AFP news agency reported. Rumsfield and a US military delegation will be received by HM King Mohammed VI to discuss the situation in the Arab world, mainly in Iraq and the Maghreb. Bilateral military cooperation and the war on terrorism will be also the focus of his discussions with the Moroccan Sovereign, said AFP. His visit comes after that of the FBI director Robert Mueller who paid a two-day visit to Morocco this week. In an exclusive interview with Groupe Maroc Soir, the FBI head said that the US and Maghreb countries have to work closely together to exchange information to prevent attacks and criminals from preying on our people. Therefore, associations and friendships between our countries are exceptionally important. Mueller also met with his Moroccan security counterpart and discussed ways in which they continue to cooperate together in the area of exchanging expertise on fingerprints, fingerprint databases, on giving assistance and developing a DNA database structure so that in the future they can exchange these forensic tools and be able to address these terrorism threats. Rumsfield's visit coincides with the handing over to the Moroccan authorities of three Moroccans, formerly detained in the American Base in Guantanamo Bay. Najib Lahssini, Mohamed Souleimani Laalami and Mohamed Ouali are now under the supervision of the General Prosecutor of Casablanca. Last August, five Moroccan Guantanamo detainees were transferred to Morocco by American authorities after they were arrested by the US military in Afghanistan. Some 200 Moroccans staged a sit-in on Sunday in front of the Parliament in Rabat against the visit of the US Defense Secretary Donald Rumsfeld, who arrived the same day in Morocco's capital for a two-day official visit, AFP reported. The protest, which was organized by the Moroccan Association for Human Rights (AMDH), brought together Moroccan intellectuals and lawyers. The demonstrators held slogans denouncing Rumsfeld's visit, the US led-war in Iraq and Afghanistan, and Morocco's security and military cooperation with the United States. The banners read: "No to a war criminal's visit to Morocco", "No to Morocco's integration in America's security and military imperialism", "Guantanamo: a crime against humanity" and "Down with American imperialism." They also chanted slogans denouncing "the presence of secret detention camps across the world" as well as "the State's terror practised by the US." "We (AMDH) have organised this sit-in to protest against Donald's Rumsfield's visit to Morocco because we can't tolerate the integration of the Kingdom of Morocco into the security and military plans of the USA", said Abdelhamid amine, the AMDH president. On his arrival to the Rabat-Salé airport, Rumsfeld was greeted by the Foreign Minister, Mohammed Benaïssa. The US official is expected to meet the Moroccan Sovereign on Monday in Ifran (Middle-Atlas). The Defense Secretary's visit comes after he met on Sunday with Algerian senior government leaders. Rumsfeld also visited Tunisia on Saturday where he toured the North Africa American Cemetery and laid a wreath in honor of the 2,841 US servicemen buried near the ancient city of Carthage on the Mediterranean Coast. Rumsfeld praised Tunisia, Algeria and Morocco for their role in combating terrorism and hoped to strengthen the cooperation with the three countries in this field. Rumsfeld is visiting Morocco for the fourth time. In an exclusive interview with Groupe Maroc Soir, Rumsfeld said he will be meeting with several Moroccan leaders to discuss issues of common interest. These will include Morocco's leadership in international peacekeeping and counter-terrorism efforts, ongoing and potential threats to security and stability in North Africa and the Middle East, and the strong military-to-military relationship between our two countries. 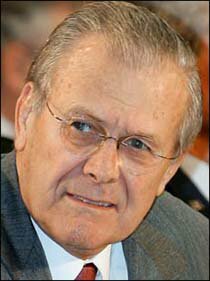 Rumsfeld said that NATO and the Maghreb countries share concerns about security and stability threats to the North African region – including terrorism, narcotics trafficking, and the proliferation of weapons of mass destruction. “That is why it is important to continue to improve our ability to communicate and work with each other,” stressed the Defense Secretary. Rumsfeld's visit followed that of the FBI director Robert Mueller who paid a two-day visit to Morocco this week. Discussing security cooperation, the FBI head also said that the US and Maghreb countries have to work closely together to exchange information to prevent attacks and criminals from preying on our people. “Therefore, associations and friendships between our countries are exceptionally important,” Mueller told Morocco Times. Today, no place in the world is terrorism free. Since 9/11, a climate of intense fear has been created, which helps the terrorists more than it hinders them. The USA, Saudi Arabia, Indonesia, Morocco, Spain, London, and recently Egypt, have all been Al-Qaida targets. In an interview with Morocco Times, Mohammed Darif, an expert in Islamist groups, discusses Al-Qaida strategies, and the involvement of Moroccans in several blasts. How do you see the world four years after 9/ 11? After Sept. 11, the War on Terrorism became the central aspect of US foreign and domestic policy under the Bush administration. War on terror is a global effort by the governments of several countries (primarily the United States and its principal allies) to neutralize international groups they deem as "terrorist" (primarily radical Islamist terrorist groups, including al-Qaida) and insure "rogue nations" no longer support terrorist activities. However, this policy fell short of expectation. It proved ineffective; the world now is less stable. Terrorist attacks multiplied and became even stronger. A number of countries have suffered from terrorism after 9/11, including Indonesia, Spain, Morocco, Saudi Arabia, Britain, Egypt, and Turkey. If we take the example of Britain for example, London was attacked despite the tight security measures the British government had taken. This lead us to inquire about the effectiveness of the security approach adopted by America and its allies to fight against terrorism. What do you think about Sept. 11 committee report? The report was not complete because it ignored a number of data. It only focused on the inefficiency of security apparatus in America, which didn't manage to track Al Qaeda members before they attacked. Before discussing London blasts and other attacks that happened after 9/11, could you briefly comment on the recent attacks on Sharm El Sheikh? The goal of Al-Qaida now, is to generate a level of fear and instability in the world, targeting innocent civilians. There were several successive attacks that rocked the world, most recently London and Sharm El Sheikh. But I believe that the strategies and the objectives of each attack are different. There is absolutely no link between the London blasts and the Sharm el Sheikh attacks. The Egypt attacks were connected to bombings in other Red Sea resorts in October last year, in Taba. For instance, They were masterminded by the Islamist Group of Egypt, who are directly connected to the ideology of Egyptian Afghans, outlined by Aymane Zawahiri. Their primary goal was to threaten the country's $6.6 billion tourism industry. It is certain that the leadership of the Islamist Group in Egyptian prisons have reconsidered their perceptions and visions since 1997. Since that date, there has been a growing discussion on reconciliation between the Islamist groups and the Egyptian authorities. This group was also the author of the Luxor massacre, in which more than 60 tourists were killed. Exactly. But public opinion is now confused as to whether the Sharm El Sheikh attacks were masterminded by Al Qaida or by the Abdullah Azzam Brigades. What do you think? That's the question. The Abdullah Azzam Brigades, author of the Taba blasts, is also claiming responsibility, among two others, for the Sharm El Sheikh Bombings. Is the Azzam Brigade really the author of the July bombings? Or was it done by other cells connected to the Islamist Group of Egypt, which might have refused any kind of reconciliation with the Egyptian regime? The nature of the attacks in London and Madrid is definitely different from that of Taba and Sharm El Sheikh. The objective of the London-Madrid blasts was to generate, as I mentioned earlier, a level of fear among civilians. However, in the Taba-Sharm El Sheikh blasts the objective was to target tourism, which is a vital sector in Egypt. What do you think about the timing of the London and Sharm El Sheikh attacks? By analyzing the Al-Qaida strategy, we notice that it does not normally organize successive attacks as occurred in London, which was attacked on July 7, then on July 22, and a day later Sherm El Sheikh was targeted. It is not a question of timing! As we all know, under Al-Qaida, there are a lot of sub-cells all over the world. These cells have the task of implementing these attacks successfully. So whenever one of these cells finds it possible to execute their plan, it soon passes into action. And this action may occur in parallel with another planned somewhere else by another cell. Though there are many cells scattered all over the world, they are all under one global cell's supervision. Concerning the strategy of implementing the attacks, I have noticed that in Western countries most of the attacks were carried out through the bombing of trains, airplanes, or underground systems...whereas in Arab countries, most of the attacks were carried out through car bombs or the targeting of places, like what happened in Casablanca. What is your opinion? I think every region has its own specificity. Al-Qaida is a cell which has gained experience over the years. 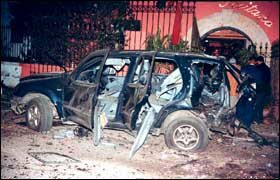 The USA attacks remain unique, because they were well planned, and the authors of the attacks were suicide bombers. Usually, when Al-Qaida finds suicide bombers to execute its plans, the attacks are said to be successful. It is the opposite of what happened in Madrid, where bombs were placed in trains because Al-Qaida could not find suicide bombers. So the posers of bombs were obliged to kill themselves later while being trapped in their flat. Normally, Al-Qaida takes a lot of time between one attack and another, but in London, there were only two weeks between the two attacks. How can you explain it? As discussed earlier, we notice that Al-Qaida is aware that it may fail in one of its attacks. That's why whenever it targets one country, four operations are planned. If one fails, the others may successfully be implemented. For instance, in the US, the 4th plane was shot down before it reached its target. The same happened in the May 16 attacks in Casablanca. Al-Qaida cells multiply their attacks to ensure their success. It is also noted that Al-Qaida does not multiply attacks in the same country, except in Saudi Arabia, in which attacks were intensified. It first began with USA, Singapore, Morocco, and Spain. Now suicide bombers get training courses in Iraq. In the future, there may be other cells specialized in implementing several attacks in different places at the same time. Some analysts say that the London attacks could be related to Iraq, though the British government excludes this idea...what are the reasons in your view? I don't think the London blasts were related to the war in Iraq. The war already existed even before the attacks. If it is a matter of the war in Iraq, it should have targeted Italy and Poland - countries which openly backed war in Iraq. Morocco as well was not excluded from Al-Qaida's list of targets; maybe Morocco paid the price for its collaboration with the US in its war against terrorism. Al-Qaida attacked the US on 9/11 even before the war in Iraq. So it's not a question of war. It is rather about the US's war against terrorism, therefore against Al-Qaida. I think the attacks on London had been planned since the invasion of Afghanistan and the arrests of the Taliban and their supporters. The reasons behind the London attacks are secondary. What's essential is that Al-Qaida is waging a war against the US and her allies for different reasons. At the beginning, they accused them of supporting Israeli policy, then the Afghanistan invasion, and so on. Why did Al Qaeda claim its responsibility late? I don't think it was late. Normally, it declares its responsibility late. For example it took a long time before it claimed responsibility for Sept 11 attacks. Osama bin laden have even denied responsibility at the beginning. As for the recent video tape, which included the message of one of the London attackers, Al-Qaida had to be very cautious to take it to the media. They had to guarantee the tape's safety and the safety of those carrying it. This reminds us of the recent attacks on Al Aqaba port, Jordan. Al-Qaida didn't claim responsibility until they made sure the attacker returned safe. What's your opinion of Blair's measures after the London's attacks, compared with those of Morocco and the US, in terms of their arbitrary detentions of Islamists or terrorism suspects? Maybe we have to exclude the United States, because what happened there was beyond comparison. Other countries' behaviour is related to their government system and their commitment to human rights. These countries take their time to investigate these attacks, avoiding immediate accusations, despite media allegations that Arabs or Muslims are the authors of these attacks. Al-Qaida criteria for choosing suicide bombers are to find people speaking the language of the targeted country, and well integrated in the society and ready to serve their cause. We noticed that the process of arrests in London was limited compared with other arrests that took place in Casablanca and Sharm El Sheikh. Morocco and Egypt immediately launched a ferocious campaign against Islamists and arrested a great number of them without having any idea of who might have implemented these attacks...What led London to be cautious is related to the nature of the country. The UK belongs to what we call the “democratic body”. I think arrests which are arbitrary do not help in investigations. Arrests in the third world are usually said to be arbitrary because they rely mainly on suspicion and they do not have such advanced means of investigation as Western countries. To get information, they mainly rely on torture. In your opinion why have the British media accused a Moroccan citizen in the first place? What are the reasons that made them jump to conclusions even before knowing who was behind it? In my opinion, there are two reasons. First, the media have noticed that Mohammed Bouyeri, Theo Van Gogh's killer, has used some expressions from Ben Laden's speeches. Second, after the attacks in Casablanca and those of Madrid, some prejudices began to develop about Moroccans. These allegations were backed up by Western media and especially Moroccan authorities, who arbitrarily detained hundreds of people. The Moroccan media talked about those Moroccans who became terrorists as if there were many of them. Also the Casablanca attacks may have contributed or may be the catalyst of these allegations against Moroccans? In all the lists presented by Saudi authorities, detailing names of terrorists, you could hardly find more than two Moroccans involved. In this case, Saudi Arabia is trying to prove that terrorism is an exported culture and that it is not home made. The fact of mentioning Moroccans in every attack (in Madrid, Saudi Arabia...), and raising the issue of the Moroccan Islamist Combatant Group (MICG), contributed to the allegation that Moroccans are terrorists. So the media started talking about the MICG. As Madrid's attackers were Moroccans, the media established the link between other cells and the leader of the MICG, Mohammed el- Guerbouzi. Moroccans were accused in the Madrid attacks, and investigations linked the May 16 attacks with the March 11 bombings? Do you think that there is a real link between the two attacks? The link has now become clear. The people who planned, and sponsored the Madrid attacks are the same who attacked the heart of Morocco's economic capital. Before, we used to talk about geopolitical strategies, but now we talk about geo-terrorism. Prior to 1996, Al Qaida grew out of the network of Arab volunteers who went to Afghanistan in the 1980's to fight under the name of Islam against Soviet Communism. The “Arab Afghans”, as known now, weren't united because they didn't agree on the same ideology. After 1996, when Ben Laden came back to Afghanistan, he tried to improve his strategies and created a certain harmony between his fellows, focusing on the Salafia Jihadia ideology. Ideologically, Al-Qaida's religious inspiration has its roots in the Wahhabi sect, the creed embraced by the current rulers of Saudi Arabia. The ultimate goal of al-Qaida is to establish a Wahhabi Caliphate across the entire Islamic world, by working with allied Islamic extremist groups to overthrow regimes it deems "non-Islamic" (ie non-Wahhabi Islamist). It sees western governments (particularly the US Government) as interfering in the affairs of Islamic nations for the interests of western corporations. Ben Laden's followers believe in a return to the values of the earliest Muslims. To this, it adds a willingness to kill apostate Muslims who do not share the creed and an obsession with death. Ben Laden also spoke of a religious duty to kill Americans and Jews. Attacking America on 9/11 is not to wage war on the west, but on the Arab and Muslim countries. As you said earlier, Moroccans emerge today as first suspects in every attack. Recently, a national newspaper wrote in its front page “Who are these Moroccans who terrorize the world?” So even in Morocco, people started questioning why Moroccans are today involved in terrorism. After the London attacks, the first reaction of several Moroccans living abroad, particularly in the UK was: “I hope the attackers won't be Moroccans”!! What's your analysis? As I said before, the media directed all its attention to Mohammed el Guerbouzi. Besides, Moroccan authorities also contributed to the development of this vision, considering the arbitrary arrests that took place directly after the attacks on Casablanca. Thousands of people were arrested in Morocco. So the authorities have also contributed to the establishment this perception and now it's very hard for them to prove the innocence of Moroccans. Another point is that most of the Moroccans involved in terrorist acts were Moroccans living abroad, who have traveled to Bosnia and Afghanistan from European countries...so there are lots of facts that contributed to the spread of this kind of prejudice. The Moroccan authorities did not only stain Morocco's reputation by those arbitrary arrests, but also by trying the detainees of Guantanamo who were sent back home? The innocence of the Moroccan detainees in Guantanamo was already proven, as they would not have been freed unless the Americans were sure of their innocence. So, Moroccan justice has been taught a lesson through worldwide critics and is trying now to avoid implicating Moroccans in trials that tarnish Morocco's image. Moroccan authorities are now taking into consideration Morocco's reputation in the world. To this end, can you give us socio-political analyses of Terrorism in Morocco? It is very difficult to talk about terrorism in Morocco, because it is not a usual practice in the country. We shall not forget that the suicide bombers in Casablanca were under the influence of the Salafia Jihadia that came from Golf countries. This concept of self-sacrifice has its origin in the Middle East, particularly in Saudi Arabia since 1991 in response to the presence of the US troops in the Arab Pennisula. I think we should not link terrorism with Morocco because terrorism is not the outcome of the Moroccan society. However, there are some Moroccans who belong to the Moroccan Islamic Combatant Group that emerged in the late 1990, apparently drawing on Moroccan jihadists who had fought or had been trained in Afghanistan. This group is trying to influence some desperate youngsters to sacrifice themselves in the name of Islam. The GICM has allegedly been associated with major terrorist attacks in Casablanca in 2003 and Madrid in 2004, respectively with its offshoot Salafia Jihadia being blamed for both. Most of these members are not Moroccans. Moroccans only implement the attacks, but the planners and the sponsors are usually from the Middle East. So, how do you react to those who say that Morocco produces terrorists? I would like to tell them that extremism needs time to impose its existence; it needs a fertile ground to sow its seeds. Our country does not form a fertile ground for such an exported culture. Our country has always lived in moderation and diversity. Moroccan society is a diverse nation: ethnic as the population consists of Berbers, Arabs, Jews, Andalusians and Africans...; language as it has many dialects; and political because it has many political parties; and religious as there are Muslims and Jews coexisting for decades. Many Islamic moderate groups have been formed. They constituted no danger as they are against violence. We have a moderate government as we adopt the Malikit doctrine, which is a tolerant doctrine. The Salafi philosophy is marginalized in Morocco. Only two people from the Salafia El Jihadia, who were arrested after the May 16 attacks, were for violence. These include Youssef Fikri and Abdel Wahab Rabbaa. This doesn't mean that Moroccans are terrorists and are adherent to Al-Qaida cell. In Morocco, extremists cannot have public support. After May 16 attacks, Morocco was not targeted again because there was no terrorist cell or body in Morocco. To avoid mixing up things for our readers, one hears about Al-Qaida, El Jamâa El Maghribia Al Moukatilah and the Salafiah El Jihadiah, but still can not distinguish between them. What are the differences and the common points between the three? El Salafia El Jihadia is not a body. It is an ideology. It is a philosophy or a faith. We can't say there is a body called El Salafiah Al Jihadiah, but we can find some organizations following an ideology. The Salafiah El Jihadiah consider Al Adl wal Ihssan and other Islamists, who are against violence, unbelievers. And they think that Jihad against unbelievers is a religious duty. This Jihad, or killing, is against the enemy, the unbeliever, and here we have a difference between the far enemy and the close enemy. The far enemy is the Christian and the Jew. The close enemy is the Moslem who believes in democracy, elections, parliament and so on. For them, believing in these is a sign of apostasy. Democracy is apostasy because legislation is given to the people, whereas for them, legislation is given only to God. The priority in Jihad is given to the close enemy. Members of Salafiah Jihadiah think that it is a priority to kill those who believe in democracy and parliament, though they are brothers in the same religion; they don't consider them as Moslems but as apostates. So they give the priority to the killing of their brothers, before the Christians or the Jews. As their ideology is to fight the close enemy before the far one, the question is what is Al-Qaida fighting in America and European countries? It is simply because Al-Qaida thinks that America and European countries help the systems in the Arab world. So it is trying to fight them and to put them under pressure to make them stop sponsoring others. So we are not talking about an organism, but about an ideology. And the Al-Qaida organism is an organism that adopts this ideology. This does not mean that all members of Salafia El Jihadia are members of Al-Qaida. Finally, do you think that the capture of Ben Laden will change any thing? The capture of Ben laden will keep the status quo, as I mentioned before, the organization became well organized and it has a definite ideology that spread throughout the world. There are hundreds of Ben Laden followers in Europe Middle East, North Africa, America..
Mohammed Darif, is a university teacher in Casablanca, and a political analyst specialized in terrorism and Islamist groups.